10:00am Zac Posen 11/14-11/16 10am-6pm Up to 80% off 33 E33rd st 12th fl. 9:00am Repeat Cashmere 11/17-11/18 9am-5pm 141 W36th St, 7th Fl. 9:00am Edie Parker 11/17-11/18 thurs 9am-8pm / fri 9am-5pm Marriot Eastside Hotel 525 Lex ave @49th St. 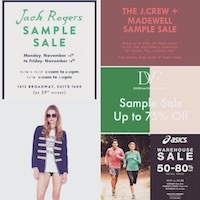 Tagged Fashion, itlist, Sample Sales, Shopping.